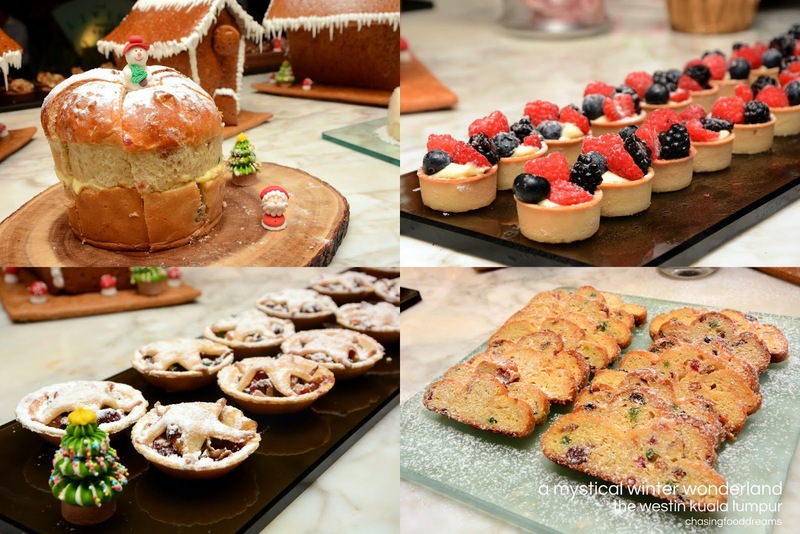 Twinkle in the glittering Christmas season with precious moments and bountiful indulgences at The Westin Kuala Lumpur. It’s the season for feasting and there’s no better place than right in the middle of our metropolitan city of lights and delightful culinary melting pot. We made it to a gorgeous and magical Christmas Light Up at the prestigious The Westin Kuala Lumpur this year in honor of their unveiling of their enchanting Christmas Tree Globe. Themed Mystical White Wonderland, the hotel’s lobby was graced with majestic winter whites and blues of glittering ornaments, Christmas trees and beautiful people dressed to the nines. After the Christmas light up ceremony, we headed to The Living Room for a taste of Winter Neverland buffet filled with festive treats from all their dining restaurants in the hotel. Take limelight is a big bird of Roasted Whole Turkey served with giblet gravy, roasted vegetables and all the usual trimmings. Fans of beef will head straight to the carving station for the classic Roasted Prime Rib! Beautifully roasted with juicy and pink doneness, slices of the prime rib goes really well with hot gravy or fresh horseradish and mustard. Pies and more pies, all golden, flaky and beautifully tempting at sight. Seafood Pot Pie, Cottage Pie and Vegetable Lasagna oozed with much comfort flavours. 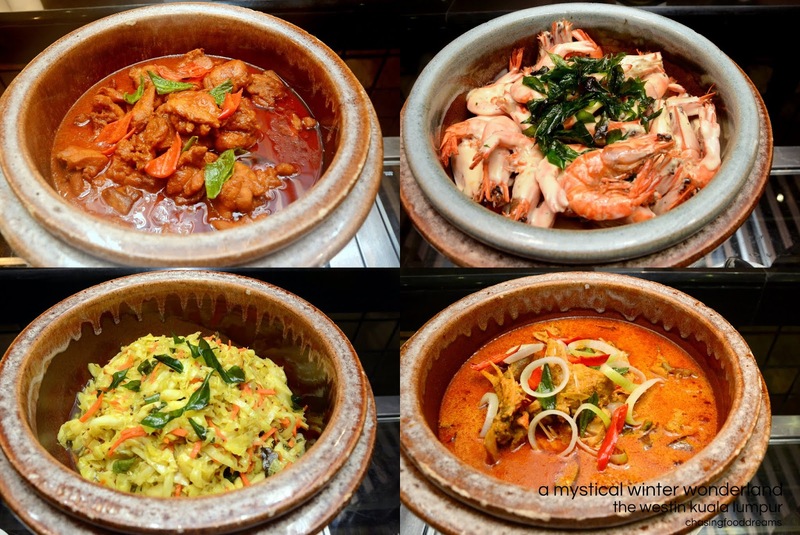 Besides all the traditional favorites, there are also some local dishes like Chicken in Indian Spices, Chinese Butter Prawns, Fish Curry as well as Curry Laksa Noodle and more. 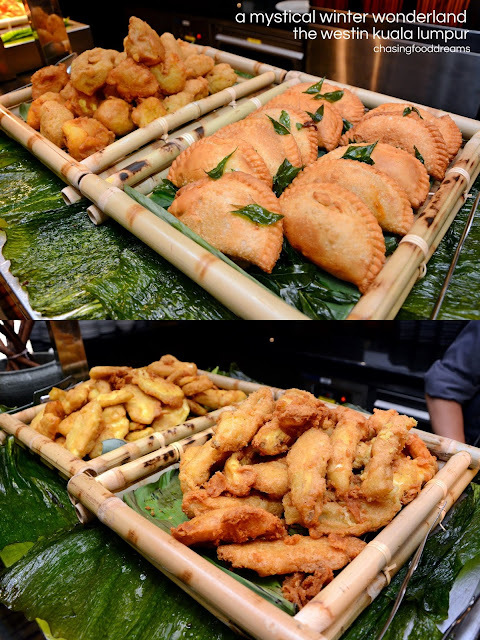 Tuck into local favorite snacks of Curry Puff, Pisang Goreng, Ubi Goreng and more for little bites of delight. From Prego, Chef Ricky Parlanti is whipping up morsels of Salmon Tartare, Creamy Cheese and Mushroom Risotto and more at their Bubbalicious Brunch as well as their special 6 course Dinner for Christmas Eve and New Year Eve. Head over for an unforgettable Brazilian Churrascaria Splash filled with Picanha or Rump of Beef, Roasted Boneless Lamb, Grilled Piri Piri Chicken Wings, Grilled Pineapple and more. This is one of my favorite restaurant and station to visit as the BBQ meats and pineapple are just superb! There’s also Five Sen5es for delicious Oriental Sanctuary feast filled with Deepfried Crispy Yam Puff with Fresh Scallop, Steamed Charcoal Black Truffle Prawn Dumpling and a lot more of Chinese dim sum and dishes. The Steamed Charcoal Black Truffle Prawn Dumpling was so fabulous that it was always quickly grab by many diners as soon as it landed at the buffet counter. Perhaps the best part of Christmas buffet is the dessert but don’t just take my word for it. Pictures of gorgeous and delectable desserts include crispy red velvet topping on the classic French Croquembouche, Chocolate Slippers, Pantone, Minced Pies, Stolen, Mini Fruit Tarts, Dark Chocolate Mousse, Mini Chocolate Cups, Raspberry and Pistachio Slice, Fruit Cake and lots more. With a better you and the little one in mind, Westin will create an exclusive children’s playground on Christmas Day allowing adults to indulge stress-free. Our young guests enjoy complimentary access to our Kid’s Playground with supervised games and fun activities.